Finally! It took us getting together yesterday and just DOING it. I am so excited because I am in this venture with one of the most creative people I know. Seriously. So far Melissa (of The Polka Dot Chair) has two pdfs in the etsy shop. 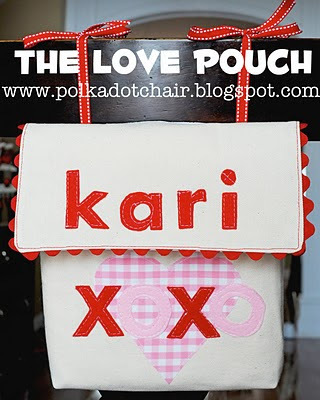 One is for The Love Pouch and the other is The June Bag. Both are pdfs files with complete instructions (photos and all) for each project. I plan on having Valentines pendants in there by this weekend. Wish me luck! how, fun! great patterns too! Oh good luck! Those are so cute and I can't wait to see what you add!!! Congrats! How exciting. Can't wait to check it out! I'm so excited and happy for you guys. 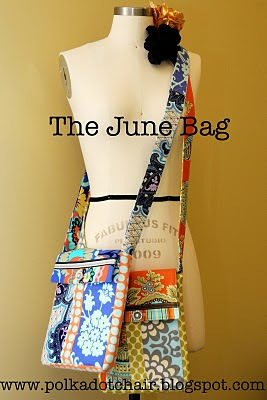 I've already purchased the June Bag pattern and I can't wait to see what else will be in your shop. Good Luck. i love the june bag! i just purchased the pattern. i work with vulnerable women in zambia, africa a few months every year and a year ago we started a sewing initiative where the women are learning how to sew. we're already up to 7 machines and over 70 women in our classes. when i go back to zambia this summer i want to bring patterns for some new items to make and this bag will be perfect for them! i'm going to make this myself and get familiar with it so i can teach them how to do it. thanks so much for doing this!